I have always wanted to paint but I am afraid. Afraid of wasting expensive canvas. Afraid of wasting art materials with my clumsy strokes. But how can I become a painter if I don’t use up art supplies? That’s the conundrum that has paralyzed me for years. Until now. I started taking painting lessons from a dear friend and fabulous artist. You would think this would be intimidating but she’s an incredible teacher who understands my paint neurosis. My very first exercise was to completely cover a giant canvas with bright acrylic paints. No white spots. No stopping. Just fill the canvas. It was scary but it was a canvas she’d painted over many times so I wasn’t using up something new, helping lower my anxiety. She has tons of paints and giant brushes and trowels that command you to work big. I made three giant canvases that day. The second lesson, I told her I wanted to paint pears. Always loved the look of pears in paintings and photos. So, she hung a giant sheet of paper on the wall and said: paint pears. I painted two really, really big pears. They are deformed but they are recognizably pears. Last weekend, I said I wanted to paint a face. I sketched a giant face that filled the canvas. Sketching is giving my chalk scratchings too much credit but it was recognizably a head. I painted the background fiery red and yellow. Now what? How do you actually paint a face with planes and light and shadow? You just do. Gently coaching, she suggested adding white to the top of the nose the way the light hits, triangles below the cheeks, shadows on the edges, ears that hang lower than I imagined. And finally, my Spanish Senorita came to life. 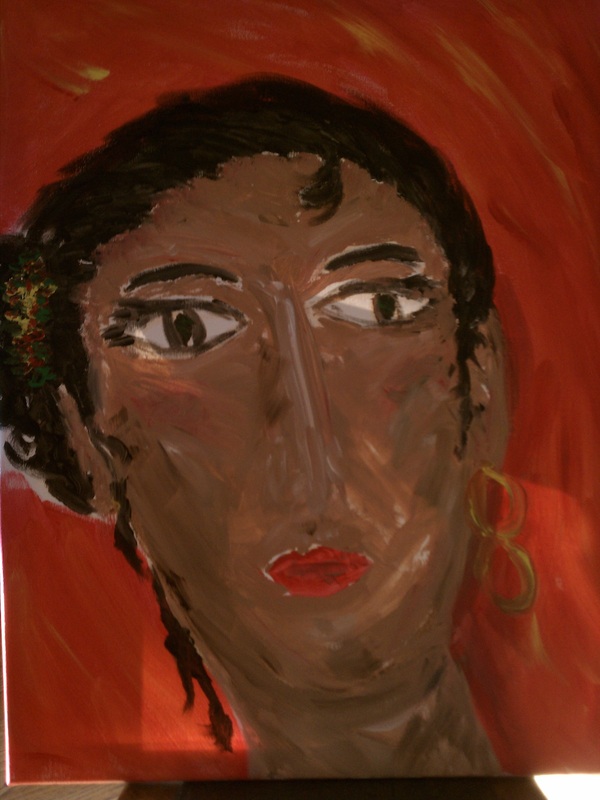 It’s not a beautiful painting but as soon as you see it, you will see my Spanish dancer’s visage. I am painting. I love it. And I am wasting paint and canvases and going to the art store to buy more. Discovering you can do something that always scared you is such a rush. Previous Iconic Icons for your Hurricane Irene tweeting and posting because this storm is going viral! Next Caught between a rock and a heart place. Life in the Sandwich Generation!